A wheelchair chest harness is designed to promote proper positioning for the upper trunk of the body while seated in a wheelchair or transport wheelchair. Wheelchair harnesses can safely help a person sit comfortably for long periods and allow the person to use their arms and hands to the best of their ability. There are a variety of designs to choose from based on the patient’s body frame, wheelchair type, and budget. 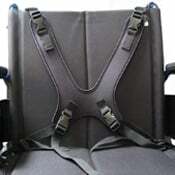 Generally, wheelchair chest harnesses are used in conjunction with another type of wheelchair positioning aid such as a lap belt (seat belt) or leg strap to provide a complete wheelchair positioning system. This page provides information on ensuring you use and maintain a wheelchair chest harness in the safest way, provides information on how to select the right wheelchair chest harness, and also provides tips on installing a wheelchair harness. Use the chest harness in conjunction with a lap belt or seat belt that is firmly fastened at all times. A chest harness should be considered part of the overall positioning strategy. Purchase the correct size. An incorrect size can pose many dangers including strangulation (can occur if the user is sliding downward forcing the harness up toward the neck), asphyxiation (can occur if the chest harness is too tight, preventing normal breathing), or broken bones (can occur if the harness is too large and the user slides out of it and falls). All of our chest harnesses have either a sizing guide or the dimensions of the harness itself for reference. Use these guides prior to purchase. Proper installation is critical. If you are not qualified to install a chest harness, find someone who can. An improperly installed harness can pose many of the same dangers stated above. A best practice is to dry-fit the chest harness with the end user in the wheelchair prior to installing. A wheelchair chest harness should never be used as an automotive restraint, nor should any wheelchair positioning device for that matter. Even if the wheelchair has a secure mount inside the vehicle, the user must also be securely fastened with an automotive approved restraint attached to the vehicle, not the wheelchair. A wheelchair chest harness is an appropriate device if the person’s upper torso / upper trunk will not stay up on its own. A wheelchair chest harness was designed to keep the user’s upper torso in an upright position. What does the doctor or physical therapist say? Often they have a better perspective on whether a chest harness will work for proper positioning. If the person in need is able to sit upright but their lower torso is sliding out from under them, a wheelchair positioning belt, lap belt, or seat belt would be a better choice. Make sure you have a compatible wheelchair seat that can accept a chest harness. Most manual and power wheelchairs with seat canes (vertical bars with the handle grips on top) can accept a harness as well as many hardback seats. Drilling is often involved for installation, so as long as there are secure places to drill, you should be ok (if you are not qualified to install a chest harness, find someone who can). Have the end user sit in the chair and dry-fit the chest harness and look for suitable mounting points before any holes are drilled. You may already have holes drilled, but if they are not in the right place, do not use them. When selecting mounting points, keep in mind that the harness should not ride up on the person’s chest and should not be too tight once it is being used. 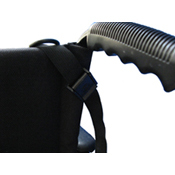 Once the wheelchair chest harness is installed, return the user to the chair and attach the harness using the pinch buckles. You will have to adjust the straps for a precise fit which may take some time. If the end user is unable to communicate comfort, make sure you can slide your hand between the center section of the harness and their body. The material will stretch a little. It is important to ensure that the chest harness is properly maintained to ensure safety. Below are guidelines for caring for your wheelchair chest harness. Prior to each use, look at the straps to see if they are frayed or worn. Inspect the stitching where the straps are attached to the center section and make sure they are still secure. 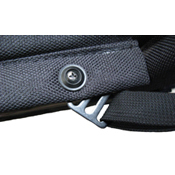 The buckles should firmly click into place and the adjustment straps should not be loose. Look at the mounting points and verify the screws are secure. If the wheelchair harness becomes soiled or dirty, wash with soap and water and line dry. When reattaching the harness to the wheelchair, make sure all of the stitching, buckles, and grommets are still secure. Ready to purchase? Review our selection of wheelchair harnesses, pads and straps. If you have any questions or need assistance, email us at support@enableyourlife.com or give us a call at 800-983-3602.